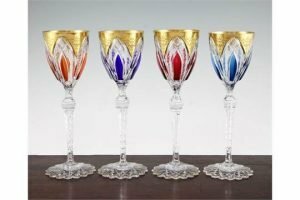 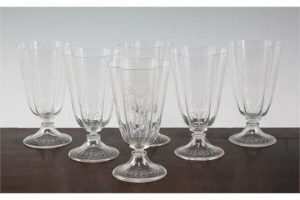 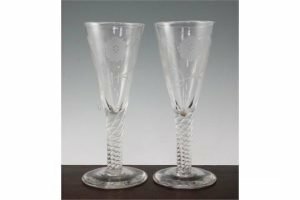 A set of six lobed drinking glasses, late 19th century, in Renaissance revival style, finely wheel engraved with birds, flowers and scrolling leaves, on a conical foot with flower garlands. 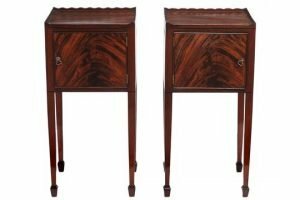 A pair of Edwardian bedside cupboards in George III style, 20th century, each with waved gallery top above a single cupboard door, on square tapering legs and spade feet. 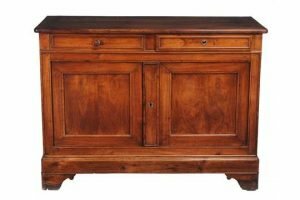 A French fruitwood side cupboard, 18th century, the rectangular top above two short drawers and double cupboard doors enclosing fixed shelves, on a plinth base and bracket feet. 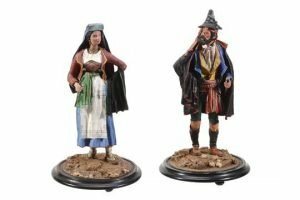 A pair of Victorian polychrome painted papier-mâché models of a southern European couple, late 19th century, each portrayed as standing on rough ground, above circular ebonized wood bases, both with applied paper labels to the underside. 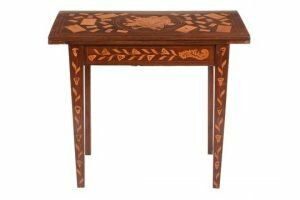 An early 19th century Dutch inlaid games table, the swivel top inlaid card and domino motifs, centred a roundel of musical instruments and a mask, the top enclosing a well and opening to a baize surface with inlaid border, on inlaid apron and tapering straight legs. 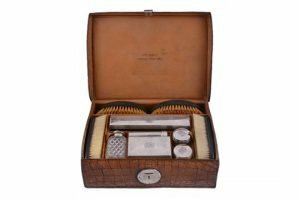 A Victorian crocodile skin gentleman’s travelling case with silver mounted fittings, by W. & G. Neal, London 1889. 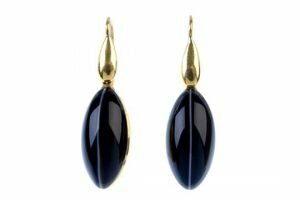 A pair of late 19th century gold agate ear pendants, each designed as a marquise-shape banded agate cabochon, to the tapered surmount. 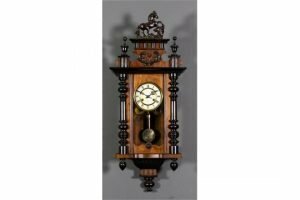 A late 19th Century walnut and ebonized Vienna Regulator wall clock, the cream enamel dial with Roman numerals to the eight day movement striking on a gong, contained in case with carved pediment surmounted by a figure of a rearing horse, split turned columns to sides and with conforming apron. 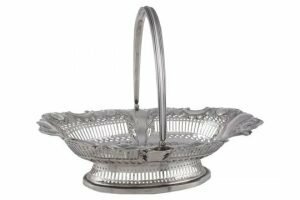 An Edwardian silver oval shaped basket, Birmingham 1902, with a threaded swing handle, embossed and pierced with C-scrolls and foliage, on an oval spreading pierced foot. 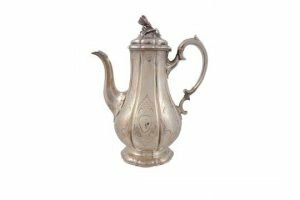 A William IV silver lobed baluster coffee pot and cover, London 1837, with a bud finial to the domed cover, a tongue-capped double scroll handle, engraved with scroll panels and a crest, on a shaped circular foot. 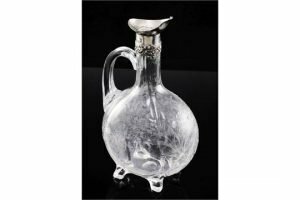 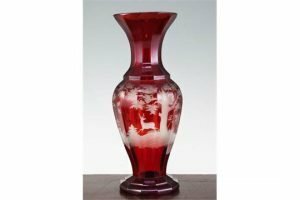 An Edwardian silver mounted rock crystal glass claret jug, the quarter lobed flask shaped body is deep wheel engraved with a hunting scene within a landscape, with scrolling cartouche borders and flowers, square section applied handle and four triangular feet, London 1904. 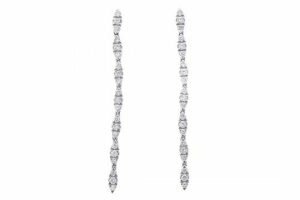 A pair of diamond ear pendants, each designed as a series of brilliant-cut diamond marquise-shape links. 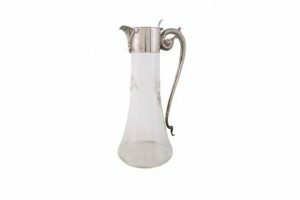 Estimated total diamond weight 0.70ct.